There are few things my two-year-old daughter loves more than a bike ride. So this summer I’ve been testing two child bike seats, the iBert Safe-T-Seat and the Kangaroo WeeRide from Kent International Inc., both of which mount above the top bar of the bike’s frame. It’s a cool concept, as your kid is essentially cradled between your arms. You can talk to your kid easily. The balance of the bike feels solid. I also find it to be more fun to have a kid right in front of you. They grab the handlebar and pretend to steer. However, these seats are not without their major flaws. Indeed, in my tests performance suffered severely, as I had to pedal slightly bow-legged to avoid knocking knees on the seat. This cuts much of the power from your pedaling, making it difficult to climb even the tinniest of hills. It’s also difficult with either of these models to pedal while standing up. If you want performance, look elsewhere. But for cruising around, for biking on relatively flat trails or down the sidewalk, these seats work fine. Of the two center-mounted seats I tested, the iBert Safe-T-Seat (www.ibertinc.com) was preferred. It’s slightly more expensive than the Kangaroo WeeRide — at about $90 for the iBert, versus $50 for the WeeRide — but its design is cleaner and its bulk less in the way. The iBert Safe-T-Seat mounts via a single prong of metal, which attaches to your bike’s stem under the handlebars. The seat slips on and off easily with the release of a single keeper pin. My one complaint with this model is its plastic seat arm, which folds on a hinge to let the child sit down, then snaps shut for safety. There is a webbing harness as the main safety attachment. But the plastic seat arm on my test model would not properly snap shut. The Kangaroo WeeRide Seat, a model distributed by Kent International Inc. (www.kentbicycles.com), is bulkier than the iBert, though it does have a couple advantages. Attaching this model to your bike takes about four times as long as with the iBert. The bar assembly is much bulkier, too, as it spans the whole width of your top bar, connecting onto the bike’s stem and then the seat post in back. After taking the WeeRide’s mount bar on and off a couple bikes, I began to get frustrated with its shoddy hardware. The hex-head bolts became manky and started to show superficial rust. 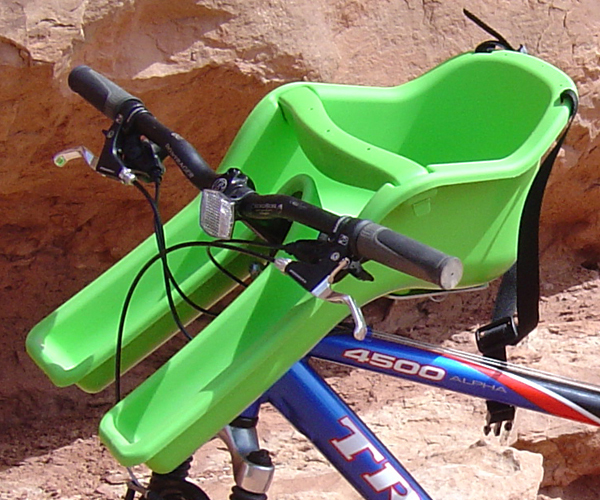 This seat also gets in the way more while pedaling, as its kid foot areas extend down further than with the iBert. One plus to this model: There’s a built-in handle/platform for the kid. My daughter, who often gets sleepy on long bike rides, could lay her head down on this platform and snooze. 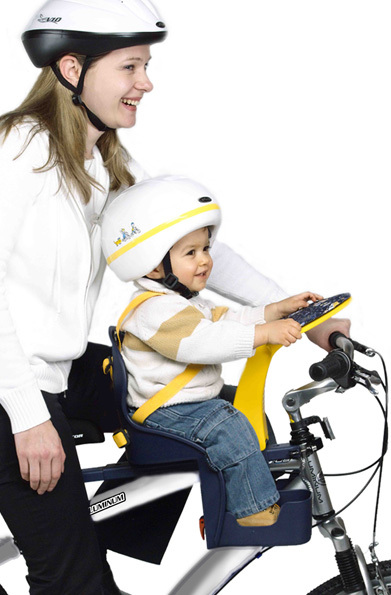 For either seat, the minimum age for the passenger child is 12 months, as he or she needs to be able to sit up and hold the weight of a helmet. My little girl, who weighs just over 30 pounds, is getting on the heavy side of comfort for biking with this setup. But she loves it, and there’s no looking back now.